Shiloh Siman Tov, 23, Sayeret Golani soldier seriously injured in vehicular accident last week, dies of his injuries. Sgt. Shiloh Siman Tov, 23, an IDF soldier from the elite commando Sayeret Golani unit seriously injured in a vehicular accident last Tuesday on Highway 6 heading south near the Nitzanei Oz junction in the vicinity of Netanya, has died of his injuries. In the accident, two IDF soldiers, Staff Sergeant Bar Yakubian and Sgt. Eshto Tepso were killed, and 10 other soldiers were injured, among them the soldier who died today, with others injured moderately and lightly. 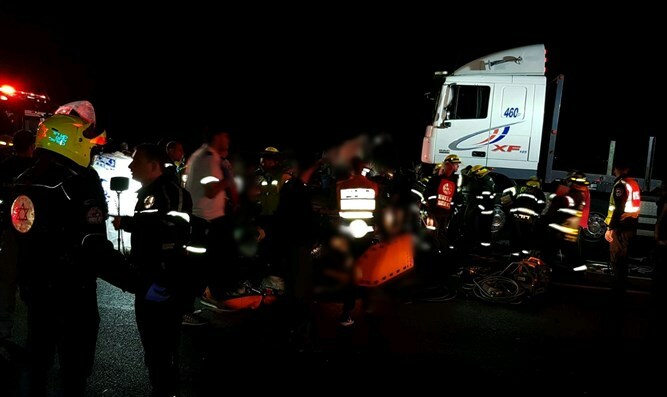 The accident occurred when a truck collided with three vehicles. Police detained the truck driver for questioning. The head of the Northern Command, Maj. Gen. Yoel Strik, announced that he had established a team of experts headed by Colonel Yair Natans to examine the circumstances of the incident. At the same time, an investigation was opened by military police into the circumstances of the accident.